Here is another example of Veterans helping Veterans by members of AL Post 170. A Veteran and Post member called to say he had to clear out his mother’s apartment in a Senior Living Complex in Canon City and he wanted to donate it to the Post for our annual yard sale. Word went out and a volunteer stepped up and a crew was formed and a date and time set and 7 Post members: Joy & Larry Lowe, Sherman & Kim Frahm, John Carroll, Jim Bidwell, and Jim Qualey – met at the apartment and brought back a trailer full of furniture for the yard sale. That morning (Jan 29, 2019) at a quick stop at VALI it was discovered that they had two pieces they wanted to donate. So, after dropping the Canon City donation off at the storage unit, we stopped at VALI and picked up their pieces and stored them. Here is the crew hard at work and a thankful after party. On January 8, 2019, Westcliffe Post 170 celebrated the 100th anniversary of the formation of the American Legion. The American Legion is our nation’s largest wartime veterans service organization, committed to mentoring youth and sponsorship of wholesome programs in our local communities, advocating patriotism and honor, promoting strong national security, and continued devotion to fellow service members and veterans. Post 170 members and along with some family members commemorated the anniversary with a special dinner at Sangrita’s restaurant. The evening ended after the group enjoyed five different kinds of cake, each cake representing one of our nation’s military services. “The American Legion was chartered by Congress in 1919 as a patriotic veterans organization. Focusing on service to veterans, service members and communities, the Legion evolved from a group of war-weary veterans of World War I into one of the most influential nonprofit groups in the United States. Membership swiftly grew to over 1 million, and local posts sprang up across the country. Today, membership stands at over 2 million in more than 13,000 posts worldwide. The posts are organized into 55 departments: one each for the 50 states, along with the District of Columbia, Puerto Rico, France, Mexico and the Philippines. Over the years, the Legion has influenced considerable social change in America, won hundreds of benefits for veterans and produced many important programs for children and youth”. On December 14, 2018, 18 people (Post members and along with some family members) attend a Christmas Card writing party at the Saddle Club. Thanks to their efforts, 2100 Christmas Cards were written and sent to deployed troops from Fort Carson Army Base in Colorado Springs. Thanks to Charles Bogle and Jim Bidwell for their efforts in coordinating this event. The Post is proud to sponsor the newly rechartered Cub Scout Troop 114. Thank you to the pack members who attended to present the charter, to Ted Johnson for his leadership, and to Doug Burgdorff for his dedication and hard work in reforming the pack, as well as leading it. Thank you also to those hard working leaders and committee members who were unable to attend the ceremony. Our first fundraiser for the year is the Health Fair Break-the-Fast. Joy Lowe is heading up this effort and needs post members and spouses to volunteer to help. Location is at the west side of CC school across the parking lot at the Ag building class room. Friday, 6 April help getting set up. Saturday, 7 April Open at 6am and finish up at noon. Joy will have a sign up sheet at the Post meeting on 6 March. the post via the contact page on this website. Free identification kits and professional fingerprinting from a sheriff’s deputy will be available in the library’s Community Room on Fri., Jan. 26 from 1 – 4 p.m. The Custer County Sheriff’s Office, American Legion Post 170 and West Custer County Library have partnered to provide identification kits for families in order to protect children and teens. Families with children ages infant to 17 years are encouraged to drop in and pick up a kit. According to the Federal Bureau of Investigation, fingerprints are important because they are unique to each individual and unlike physical appearances, they do not change over time. A Child ID kit is a simple yet effective tool to help families maintain current photos of and descriptive information about their children as well as DNA samples and fingerprints. Parents and legal guardians will keep the kits and provide the information to law enforcement only in case of emergency. Information will not be kept by any organization or agency. If a child goes missing, parents can provide the kit to law enforcement officials so that it may be entered into the FBI’s National Crime Information Center database. Those with little ones will also have the opportunity to learn about safe car seat installation from certified National Child Passenger Safety Technicians through Custer County Drive Smart, a program of Safe Kids Worldwide. 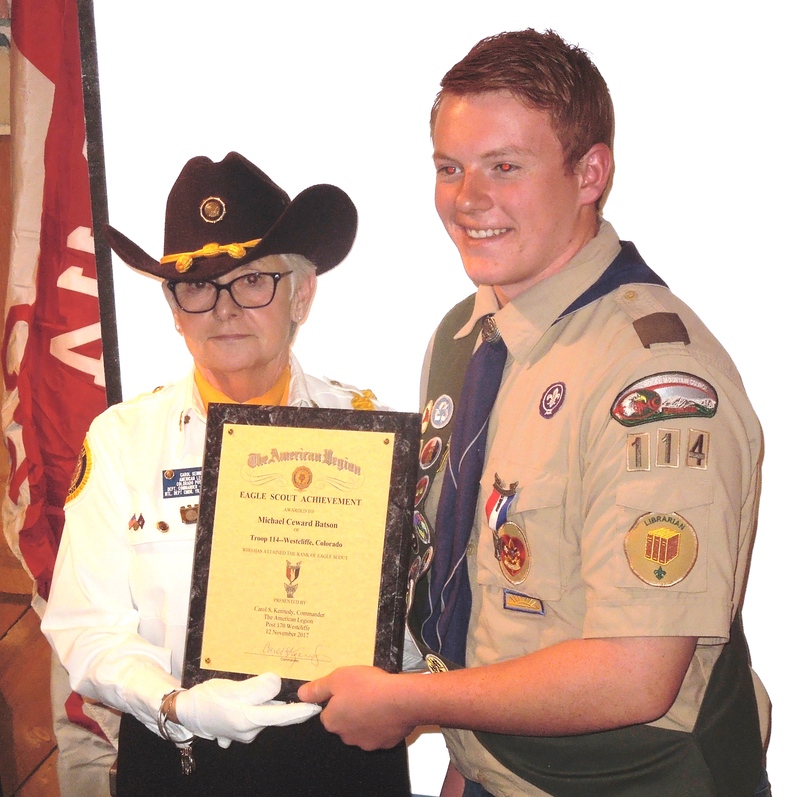 Eagle Scout Court of Honor: Post 170 of The American Legion had the distinct honor or attending the Eagle Scout Court of Honor on Sunday, 12 November at the Historic Alpine Inn. 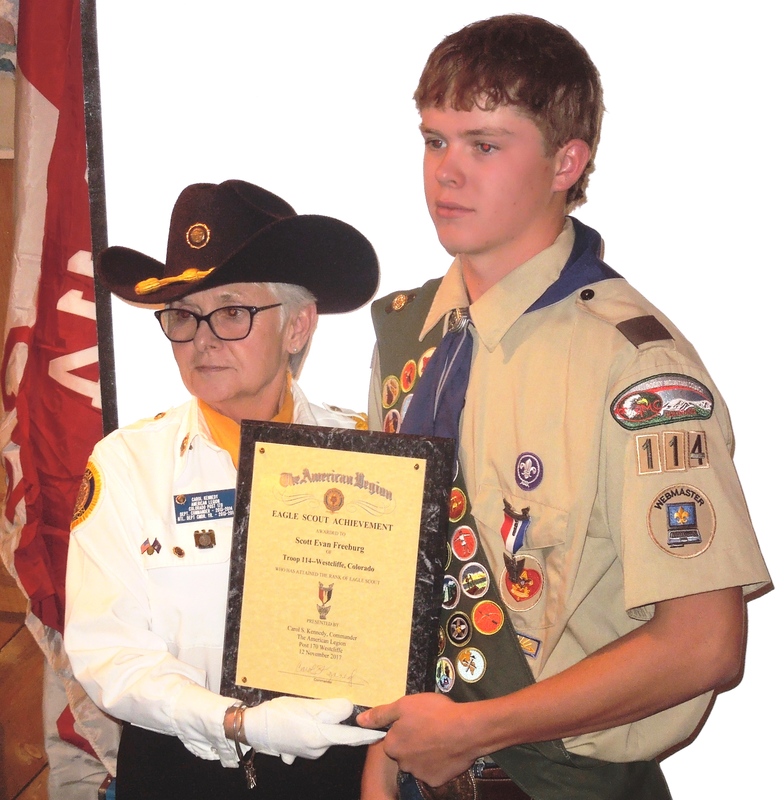 Post 170 is the Legion sponsor of Troop 114 Westcliffe. 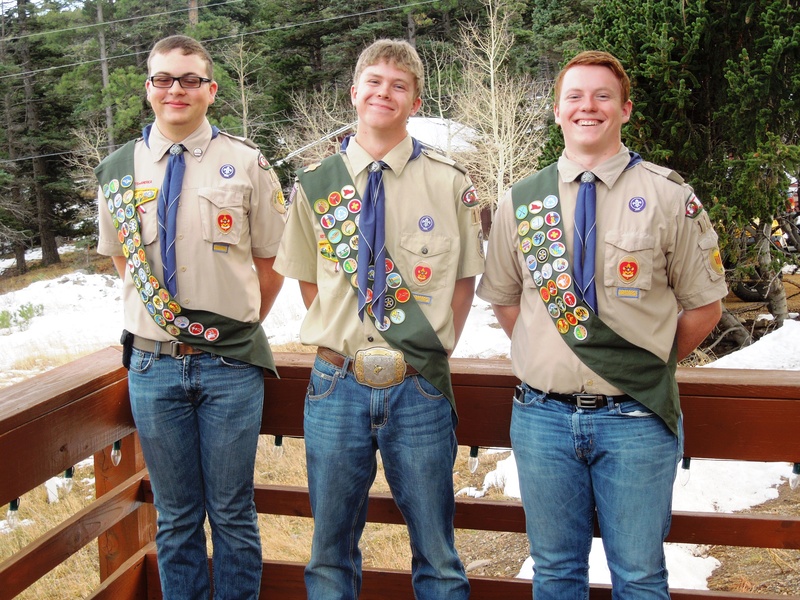 Three, yes count them, THREE of our scouts were awarded their Eagle Scout badges and certificates on Sunday evening. A great recognition for Michael Batson, Tyler Ferron and Scott Freeburg. We are so very proud of these young men. The Post 170 Honor Guard posted the colors along with the Scout colors. Commander Carol Kennedy presented certificates to each of our Eagles and Post 170 Boy Scout Representative, Jessica Carter, gave each a US Flag flown over the US Capital. We had the honor to participate in the recognition of future leaders in and of our Country.